Be an advocate for California's forests, water, and wildlife with a gift to Forests Forever on Giving Tuesday, November 28, 2017. Tomorrow is #GivingTuesday, a global day of giving that harnesses the collective power of individuals, communities and organizations to encourage philanthropy and to celebrate generosity worldwide. Please help us continue the fight to protect and enhance California's unique forest ecosystems. After Black Friday and Cyber Monday, kick off the giving season with a contribution to Forests Forever for #GivingTuesday. 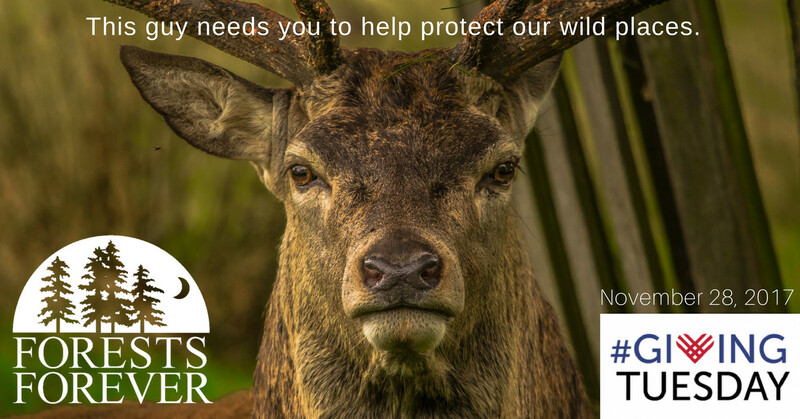 For 28 years now Forests Forever has been the only non-profit organization that works all year long protecting California's forests and forest wildlife through broad-based grassroots advocacy. Every day of the week (and on more than a few weekends) Forests Forever organizers interact directly with citizens of the Golden State. We make them aware of forest threats and conscious of opportunities to undo and prevent damage to our forestlands—and too often, to our democracy—by unbridled industry practices. We reach thousands of citizens per year with our urgent message. Now more than ever we need your support! Anti-wildland and conservation foes in Washington have placed our public lands in the crosshairs. They have introduced a myriad of bills this past year that threaten our national forests, monuments and roadless lands. To pay back their cronies — and campaign contributors — they have shown they are willing to sacrifice our heritage! Together we can stop senseless giveaways to Big Timber, but it requires your voice and your ongoing financial support. We urge you to give a generous gift to support our efforts this #GivingTuesday.